The humidity has arrived and with that we can expect plenty of allergies that can not only be an annoyance, but can lead to bigger health issues especially with kids. During these muggy months it’s important to take a moment to evaluate your health and how you take care of your sinuses and your lungs and of small children in your household. One way in which to be mindful of the quality of the air you breath is to be alert and aware of any possible allergies you may have that can affect your sinuses and your lungs. Allergies can arise from pollens in springtime, grass in the summer, and ragweed during the fall as well as dust, mites, animal allergens, perfumes, detergents, soaps, and changes in atmospheric temperature. There are a many number of factors that can cause you to have allergies. Allergies can lead to more serious issue such as asthma. Allergic asthma can be triggered by allergies to bacteria, mold to everyday pollens. Allergic rhinitis affects approximately 10%-20% of the U.S. population and 40% of children. 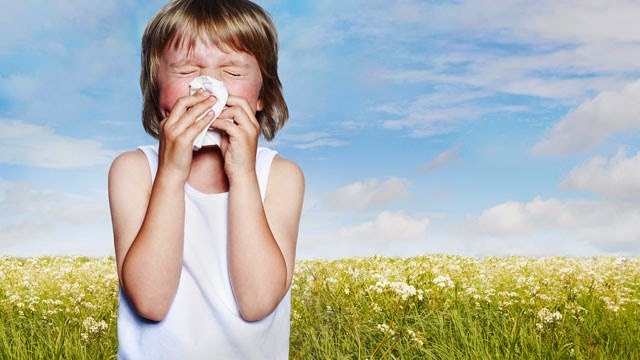 The average age of the onset of allergies is between the ages of 8 through 12. Clinical presentation of allergies usually consists of sneezing, nasal congestion, cough, postnasal drip, loss of or alteration of smell, and sensation of clogged ears which can cause a discomfort and be an inconvenience. There are many ways to treat the onset of allergies which can include non-pharmacologic therapy or pharmacologic. Maintain allergen-free environment by covering mattresses and pillows with allergen-proof casings, eliminating animal products, and removing dust collecting fixtures. Clean your air purifiers and dust filters. Maintain humidity to below 50% to prevent dust mites or mold. Use air conditioners, especially in the bedroom. Remove pets from homes of patients with suspected sensitivity to animal allergens. Topical nasal steroids are very effective and I prefer as first line treatment in adults. Ex. Fluticasone (Flonase). Oral Antihistamine, first generation antihistamine, ex. Benadryl, can cause considerable sedation and anticholinergic symptoms. Second generation antihistamine, ex. Loratadine (Claritin), Cetirizine (Zyrtec), are preferred since they cause less sedation and anticholinergic effects. Oral leukotriene receptor antagonist, ex. Montelukast (Singulair), commonly used for asthma is also effective for allergic rhinitis. Cromolyn sodium used for prophylaxis. Make the effort to ensure your respiratory system is in top shape so that you can take deep long breaths and enjoy the blooming flowers around you. Speak to your physician about ways for you to combat allergies before they become a problem. This information was provided by Dr. Hossein Joukar, MD, a board certified Emergency Medicine physician with over 15 years of experience and is the Medical Director and CEO of RiteCare Urgent Care Medical Centers in Miami.